Why is this genetic barcoding useful? Well, for one thing, it helps researchers like Aguilar identify what different fish are eating – and therefore, what impact they are having on the balance of life around them. Examining the contents of the stomachs of fish is important to biologists. But often the remains there are just mush. That makes the genetic analysis of the material critical. Recently, Aguilar and colleagues have been using this technique to try to discover the ecological impact of an invasive species in the bay and its tributaries: blue catfish. Blue cats are the largest catfish species in North America, growing up to five feet long and 150 pounds. They are native to the Mississippi River basin, and were introduced intentionally by the state of Virginia in the 1970s and 1980s as a game fish for sportsmen in the James, York and Rappahannock rivers. 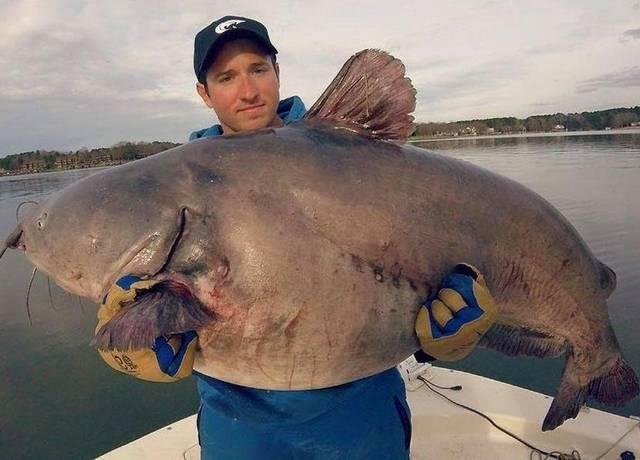 The problem is, blue cats are voracious predators that are several times larger than native catfish. They have spread to several other rivers, including the Potomac in the 1990s – and are multiplying rapidly. Some biologists worry that blue cats might gobble up and outcompete threatened native fish species that they are working to restore, such as American shad. So what Aguilar and his fellow researchers did for a recent scientific journal article titled, “Gutsy Genetics,” published in Environmental Biology of Fish, was examine the contents of the stomachs of 600 catfish that were caught and dissected. Aguilar found that while the remains of American shad were rare, other important native species of fish were much more common – including white perch and menhaden. This suggests the blue cats could be having a negative impact on the bay ecosystem. Also interesting was the fact the bellies of blue catfish were often filled with baby catfish. These included channel catfish, another exotic species introduced from the Great Lakes to Maryland rivers as a sportfish in 1889. And the blue cats were also eating a lot of their own young. Wildlife managers can’t rely on cannibalism to these invaders in check, simply because blue cats have so many offspring. But another kind of predation – by humans -- could keep their numbers from overwhelming native species. The market for blue catfish in local restaurants and seafood markets is growing, as these monsters are not only voracious but – fortunately—delicious.